Have you ever been sketching and wanted to cover a large area quickly? Or wanted to variegate the tone very subtly, similar to using watercolors? Derivan Liquid pencil is capable of all these things and more. 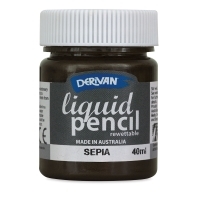 An innovative new product that allows artists to create authentic graphite pencil effects with a liquid, Derivan Liquid Pencil can be easily thinned with water to allow for the softest colors to be applied with a brush, nib, or other art tools. Because of its precisely balanced formulation, the Permanent formula "burnishes up" like traditional graphite but won’t smudge. 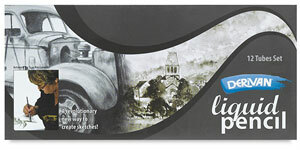 The Rewettable formula allows for removal with water or an eraser, similar to watercolor techniques. Large areas also can be covered quickly and easily. 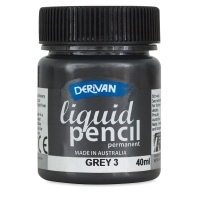 Derivan Liquid Pencil is available in six graphite shades. Each shade has a definite graphite color; however, there are distinct undertones such as Blue, Yellow, Red, Sepia, and neutral Grey in two different strengths to allow artists a great range of options. Liquid Pencil Set — This set contains 6, 12 ml rewettable tubes and 6, 12 ml permanent tubes, one each of every color in the Derivan Liquid Pencil line, including the following: Gray #3, Gray #9, Sepia, Yellow, Red, and Blue. Color Chart Note — Color charts represent approximations of the real color. Due to the many variations in monitors and browsers, colors may appear slightly different on different computer screens. ® Derivan is a registered trademark.® Derivan is a registered trademark.